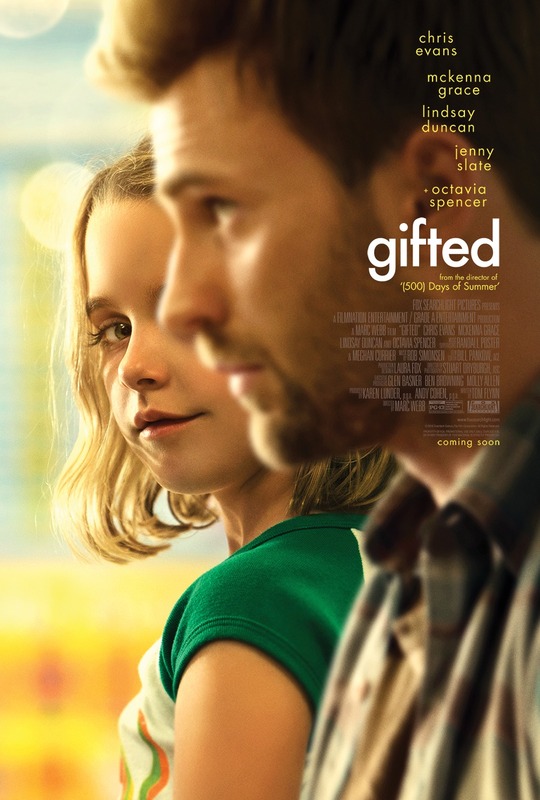 Chrichton's World: Review Gifted (2017): Charming little film! Review Gifted (2017): Charming little film! Gifted is one of those drama's where you simply know how it is going to end but don't know how it will get there. “The journey, Not the destination matters...” is a quote from T.S. Eliot and a very good description of the viewing experience you are going to have. In short this film is about a custody battle between an uncle and grandmother over Mary Adler who is a gifted child (extraordinary mathematical talent) and how she should be raised. Now I do have to state that of course the film is a little biased towards main character Frank Adler played by Chris Evans but still does a very good job of showing the other side. In this case it's the belief by Frank's mother Evelyn Adler (Lindsay Duncan) that talent should be exploited as much as possible. Since this is the kind of talent so incredibly unique and special that one day could contribute to changing the world for the better. Even if it could come at the cost of a child's youth and happiness. You would think that it is quite easy who to root for but luckily things aren't that simple. Despite Evelyn Adler being quite evil you can tell that Mary does need more than she is currently getting even if she seems very happy to have lived with her uncle all this time. There is a good reason for this and a very compelling one. But not going into it since it's one of those elements best to be enjoyed while watching. Like I said Gifted is predictable but never dull or boring. At times it's very comedic and at times you will get close to crying because of some truly gripping dramatic scenes. This film easily could have become a tearjerker. But very wisely tried to avoid this. It's through the characters that you will experience pain and laughter and not because of some tragic and dramatic violin playing. Even the adorable Mary will get on your nerves since sometimes she doesn't act like a prodigy but like a spoiled brat. Only then you realize that something is a miss and things aren't what they seem. I liked how the film allowed you to get angry at even lovable characters. But don't worry the film also gives you less likable characters to hate on. Gifted is far from spectacular or remarkable but it will give you something to think about plus it will make you feel good at the end. If like me you are a sucker for those kinds of movies then this definitely is a must watch.